The stratosphere is the layer of the atmosphere from 10 to 30 miles above sea level. "The ozone layer" refers to the ozone within stratosphere, where over 90% of the earth's ozone resides. The ozone layer absorbs 97-99% of the sun's high frequency ultraviolet light , light which is potentially damaging to life on earth. In the absence of this gaseous shield in the stratosphere, the harmful radiation has a perfect portal through which to strike Earth. The amounts of "good" and "bad" ozone in the atmosphere depend on a balance between processes that create ozone and those that destroy it. 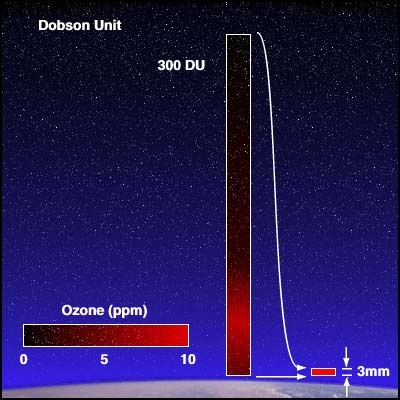 An upset in the ozone balance can have serious consequences for life on Earth. Scientists are finding evidence that changes are occurring in ozone levels—the "bad" ozone is increasing in the air we breathe, and the "good" ozone is decreasing in our protective ozone shield.